Why butterfly a roast? Butterflying and adding a rich filling helps keep an otherwise lean cut of pork moist, and makes this bargain cut infinitely more festive. 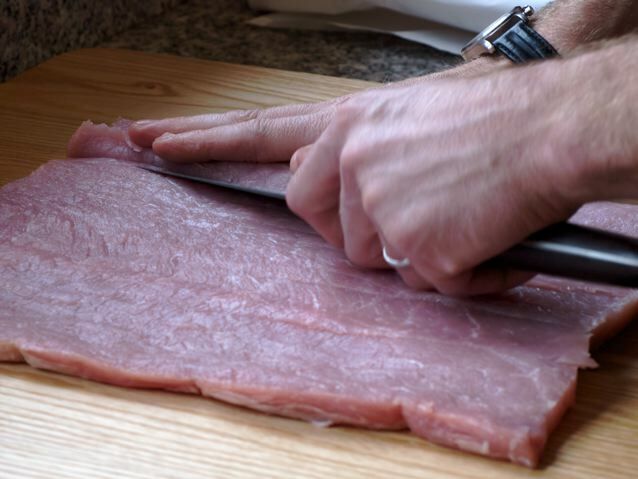 Often you can ask the butcher to butterfly the pork loin for you while you wait. But if that's not an option, don't despair. It's not difficult to do it yourself. Portlander Matthew Card is a contributing editor to Cook’s Illustrated and writes a monthly column for the Oregonian. 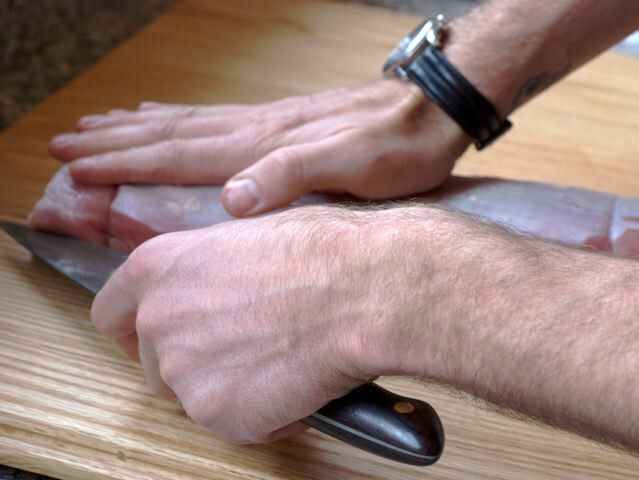 Here he shows how you butterfly a pork roast. 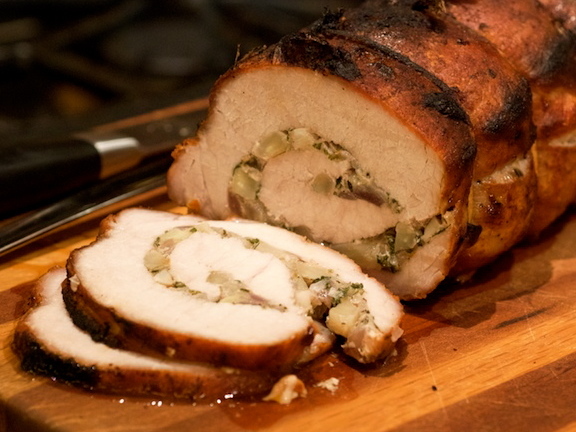 And once you've mastered that, try Matthew's recipe for Fennel-Stuffed Roast Pork Loin. #(clear n1). 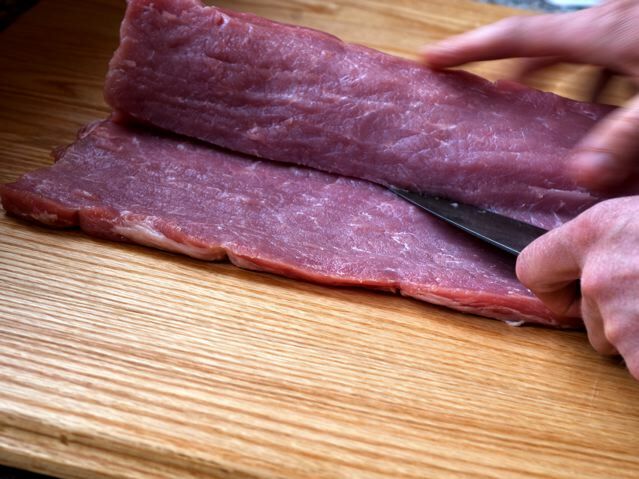 [%image one float='clear right' width=350] Start with a boneless pork loin; lay it on the cutting board. If it's tied, release the strings that bind it. #(clear n2). [%image two float='clear right' width=350] Begin at one end of the roast. About an inch from the cutting board, cut a horizontal incision, about an inch deep. #(clear n3). 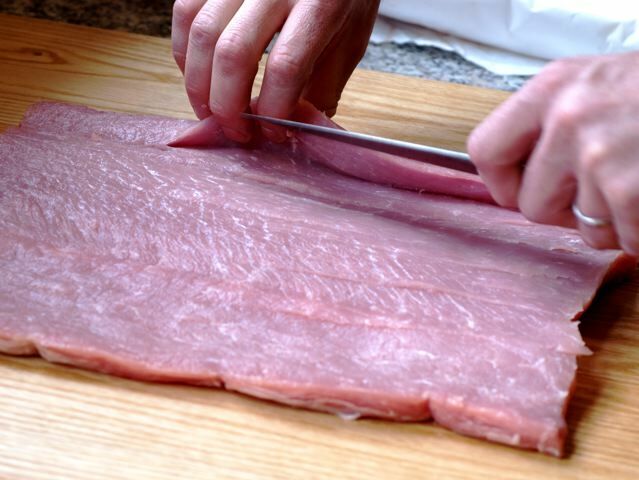 [%image three float='clear right' width=350] As you cut from one end of the loin to the other, pull back the meat. #(clear n4). 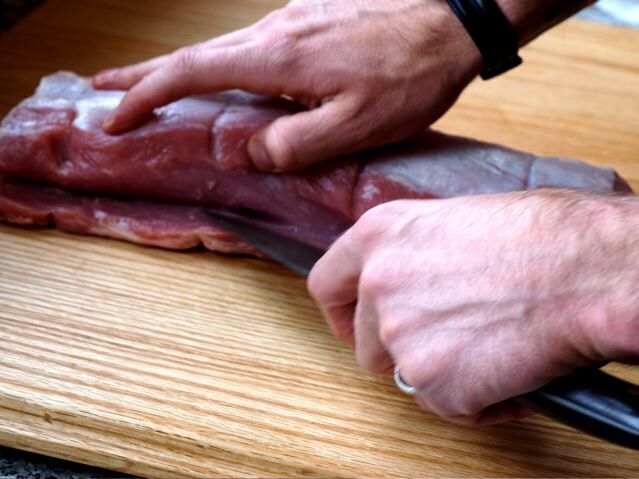 [%image four float='clear right' width=350] Once you've cut the entire length of the loin, return to the top and cut deeper into the loin, while pushing away with your free hand, as if you're unfurling a paper towel. #(clear n5). [%image five float='clear right' width=350] Each time you'll want to cut in no more than an inch. #(clear n6). 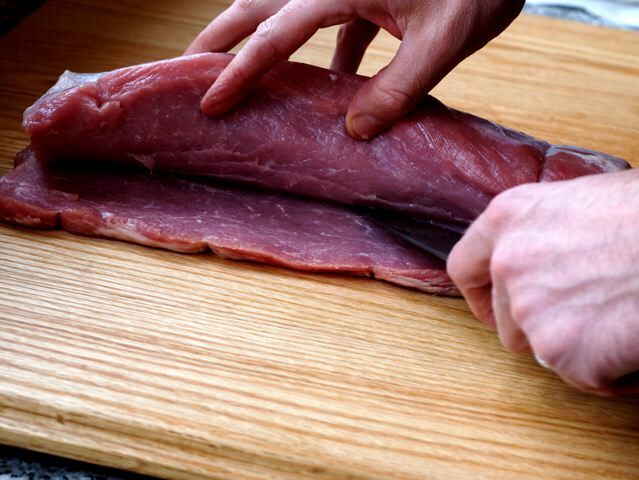 [%image six float='clear right' width=350] Repeat until you've cut the entire length of the loin. #(clear n7). 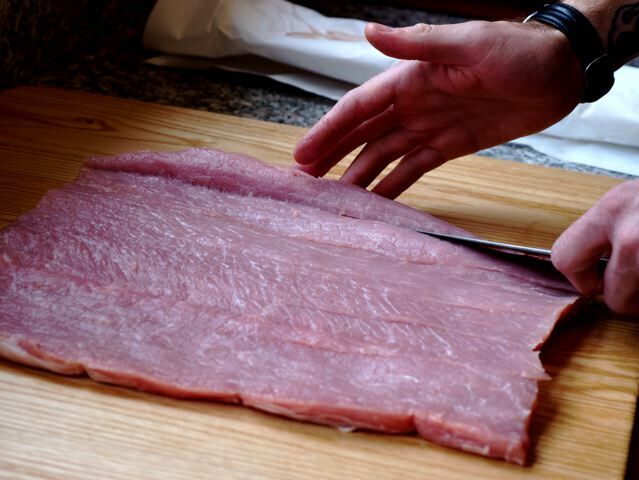 [%image seven float='clear right' width=350] Eventually the loin will lie flat. #(clear n8). 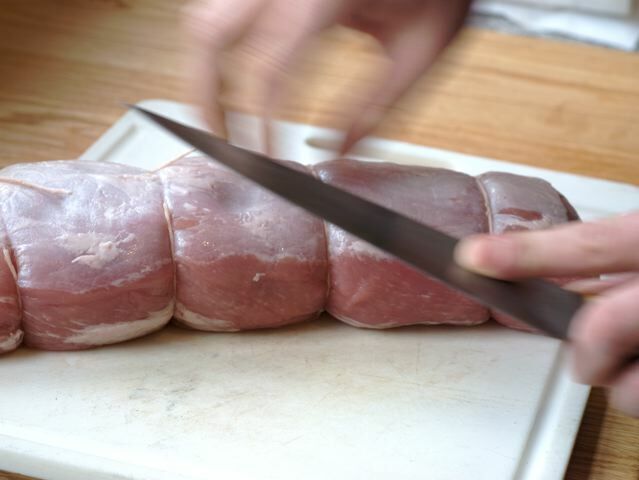 [%image eight float='clear right' width=350] Your pork loin is now ready for stuffing and rolling.